In the post-Suharto era, Indonesia is undergoing fundamental change, challenging how many observers understand the state, its institutions and its people. Indonesia: The Uncertain Transition seeks to explore this process of change, confronting many of the earlier assumptions about Indonesian politics and society. Ranging across subjects as diverse as presidential and Islamic politics, the role of the armed forces, separatism, the media and civil society, this book examines Indonesia from perspectives that are freed from the constraints that were imposed under Suharto’s New Order. These perspectives are brought to bear, often critically, on the process of Indonesia’s transition from an authoritarian state to a new democracy. As the contributors point out, this process of transition is far from complete and still faces many difficulties. The contributors note that the Cabinet of President Abdurrahman Wahid has been divided, while other institutions including the People’s Representative Council now assert greater political authority. Even more importantly, the relationship between the central government and the regions is also undergoing a profound shift, with moves to decentralise political authority and economic responsibility. This book notes that if such decentralisation is not successfully carried out, the future of the state itself could be in question. 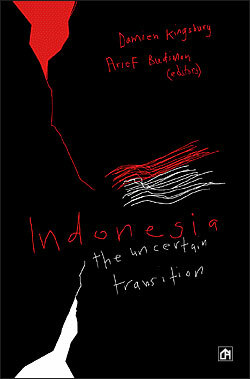 This book is not only concerned with trying to keep track of changes in Indonesia. It also examines how observers and critics look at Indonesia, and how their thinking on Indonesia has been forced into accepting a greater flexibility than in the past. To this end, the contributors were encouraged to ‘rethink’ Indonesia and to reconsider the issues with which they were dealing. Not only does this book reconsider in a very basic way much of Indonesia, but it also acknowledges that this whole process of change in Indonesia has been problematic. With such great change in the offing, with the stakes so high and affecting so many people, the options for change, for the process of transition, have been deeply contested. The contributors to this volume are all experienced observers of Indonesia, though their backgrounds are mixed. Most are academics, from Australia and Indonesia, who bring to their contributions the interests and rigours of their disciplines. Others are activists or actors in the political process. The blending of contributors, the editors believe, has made a stronger and more durable book. The text groups together subjects in their primary areas of focus, each section with a brief introduction of its own. Indonesia is at a critical juncture, poised between the end of an era of repression and a future filled with unknowns and the unknowable. Indonesia and its people have hope and, most often, a commitment to attempting to build a better future. This book shows how that is being put into practice, and indicates the chances of success.